I was Shkoder bound. 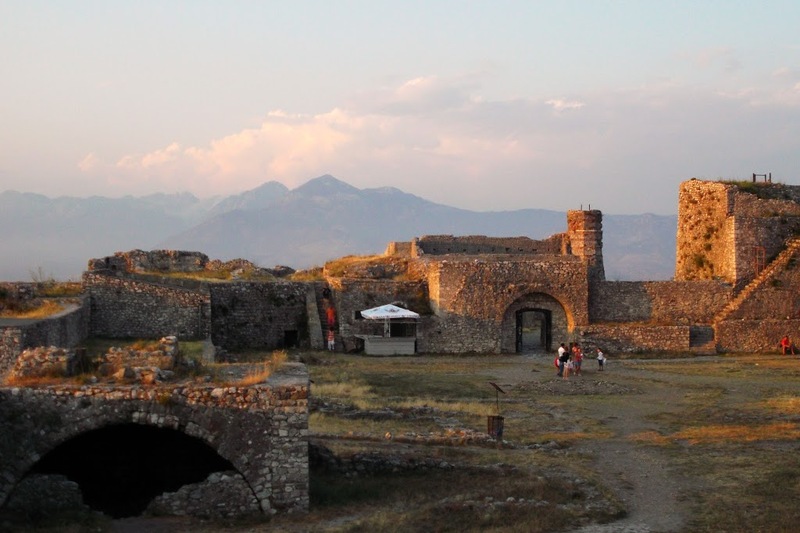 I didn’t know much about Shkoder, except that it has global recognition because of the blood feuds that still happen in northern Albania. Shkoder is perfectly fine to travel to, as it’s in the northeast, a major city and easy to travel to, but the travel books I’d seen in the hostels over the past few days had said that northwest Albania is on travel advisory lists for British, Australians and Canadians because it’s so remote that the government basically doesn’t have much sway up there and it’s all mafia run. I was looking forward to having a few days up there to see what was going on. 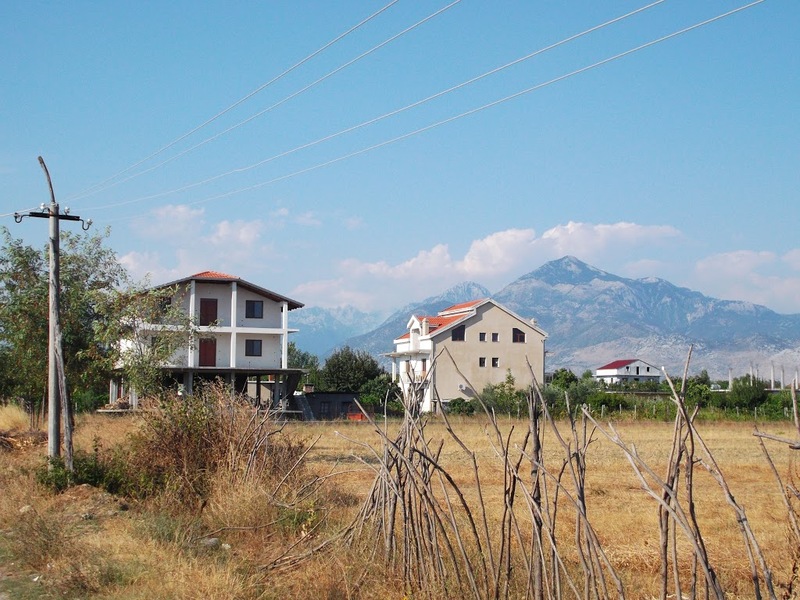 The bus dropped me off in central Shkoder, the biggest city in northern Albania, without me realizing that we had arrived in Shkoder. I got off the bus and a cab driver with a surly demeanor was immediately jabbering away in my face. I told him slowly in English as I hoisted my bag that I had no idea what he was saying. I realized a few minutes later, as I was debating which street to wander down in search of a guest house, and he shoved a flier under my nose, that he had been saying: accommodation? I said yes, and he got on the phone. You need accommodation?The voice on the other end of the phone asked. I said yes. We have accommodation. Okay, I replied, that sounds like what I need. How do I get there? You go with this man. So I got into the cab and we set off. We drove a while down narrow streets, heading further away from the center of town. I wondered what I had gotten myself into. 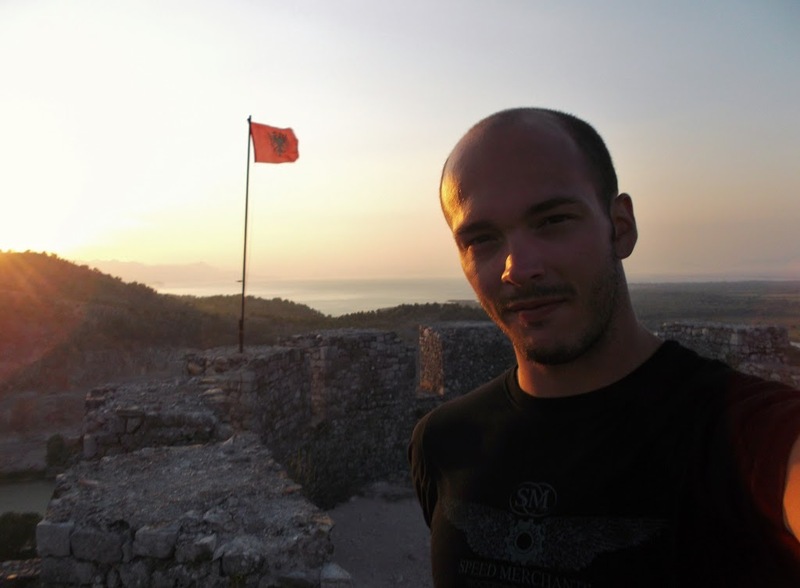 I could imagine the headlines: American Traveler Disappears in Shkoder, Albania. But then I remembered that I was in Albania and there probably wouldn’t be any headlines, people would just wonder why I was staying in Albania for so long. 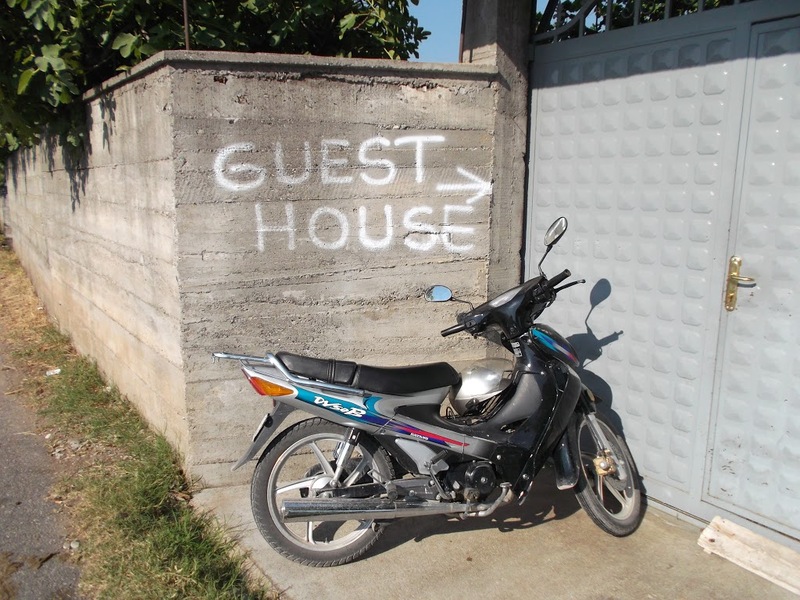 But we eventually got to a place that had “Guest House” spray painted in white on the wall outside the gate. I went in and the owner, Florian, showed me the room and I put my bag down. He asked if I wanted tea or coffee, and I foolishly said coffee without remembering that usually this means that you’re going to be drinking milky Nescafe. I was pleasantly surprised to get a nice cup of Turkish coffee. I sat outside talking with Florian, the owner of the place. He wondered where I was heading next, and I said I wanted to explore the mountains, Thethi and Lake Koman. He said that the minibus to Thethi was at 8am and the minibus to Koman was at 6am, so I decided I’d head to Thethi the next day. He said he’d arrange for the minibus to pick me up and he’d call a guy up in Thethi to give me a place to stay the next night and would help me get to wherever it was I would be going next. Lake Koman or another village, Valbone, were easily accessible from Thethi. 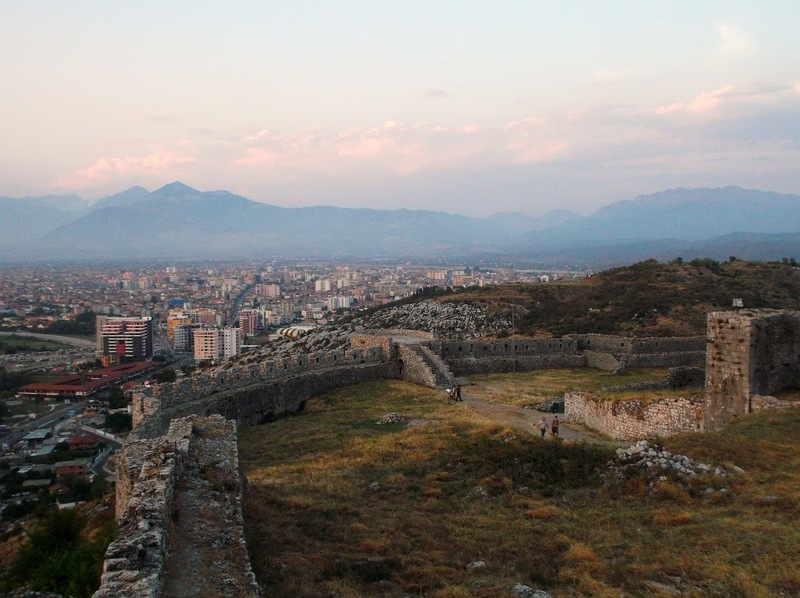 I didn’t know what there was to do in Shkoder, so I asked Florian. 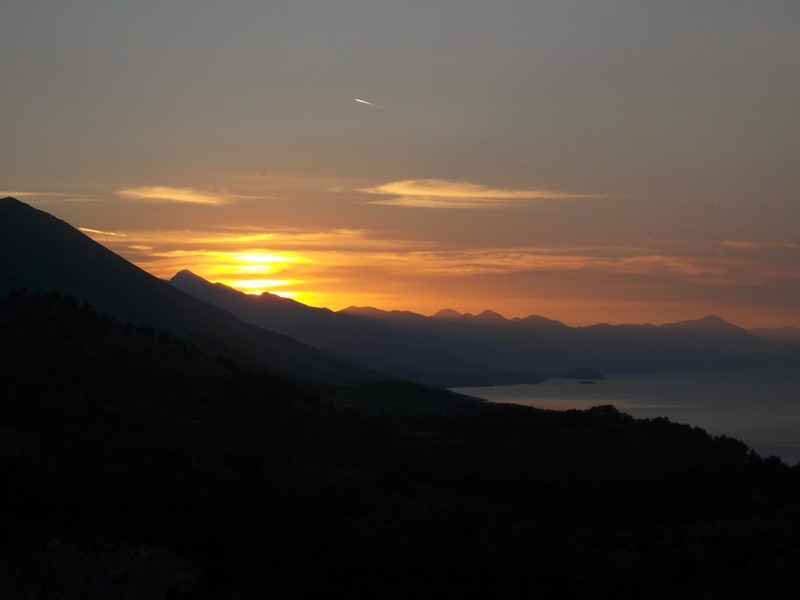 He said that he arranged tours of Shkoder and could get a taxi to drive me around, since all of the sights were far apart. But since I was only one person it was a bit expensive. I figured it would be worth it, though. No sense going to Shkoder and not seeing anything. 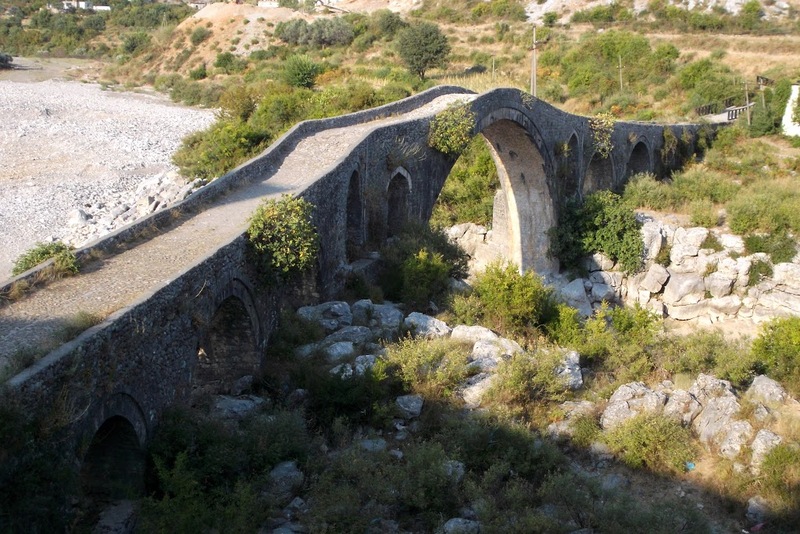 We drove first to an old stone Ottoman bridge from the 18th century. 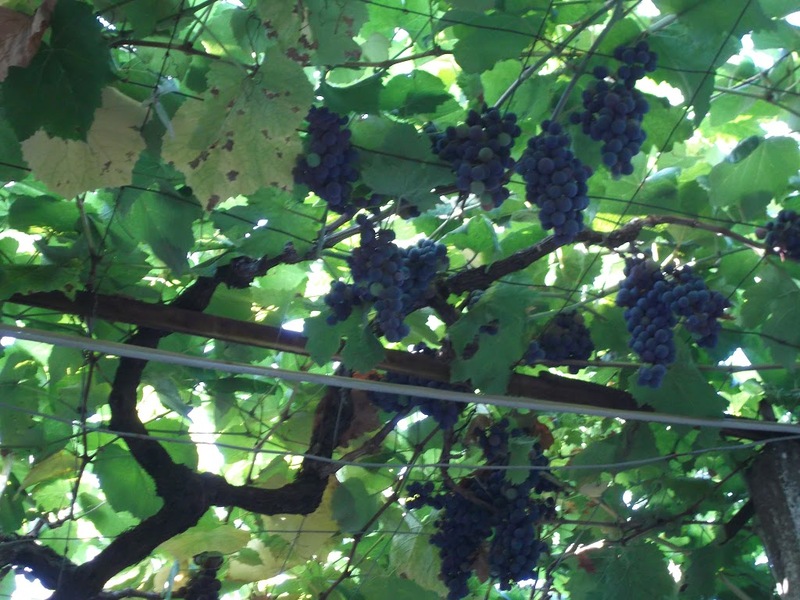 It spans what is a raging river in the winter and a dry stone riverbed in the summer. 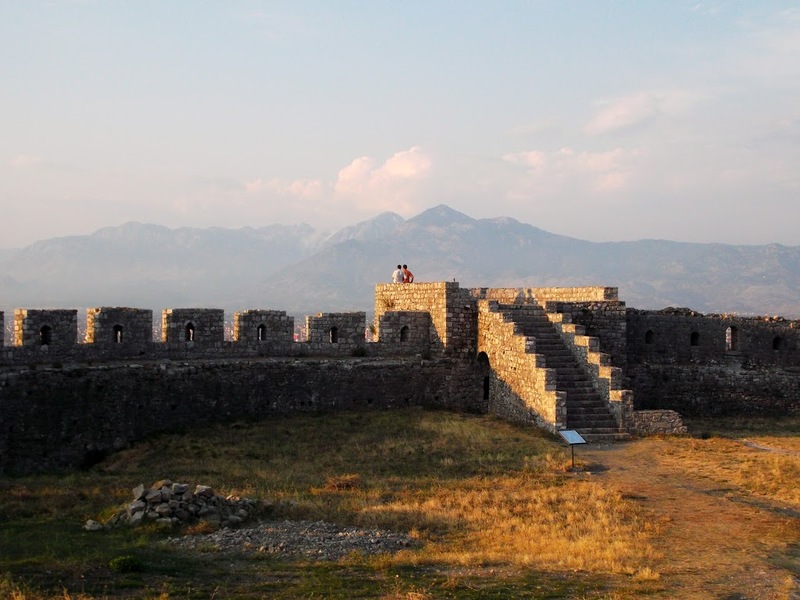 We then went to the Rozafa castle, Shkoder’s castle on the hill. It’s a huge structure that the Illyrians built some 2,400 years ago. 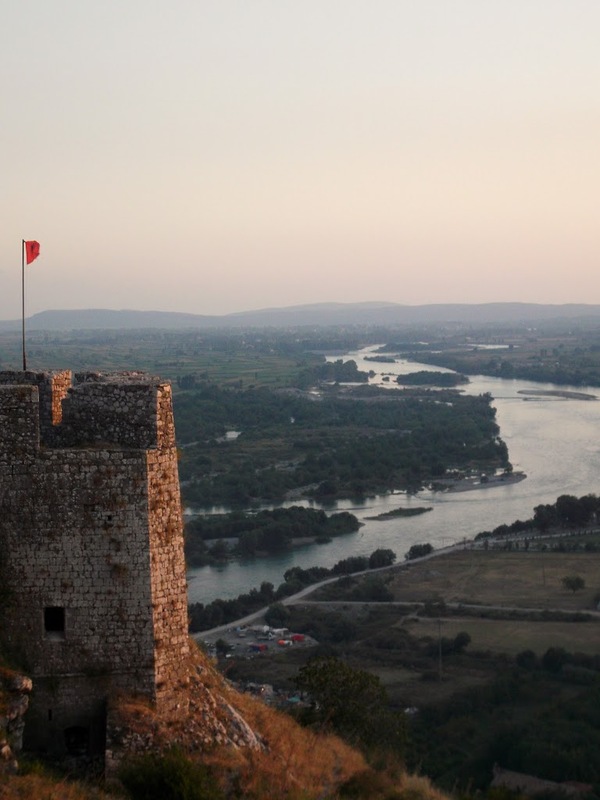 It changed hands, as did Shkoder, from the Illyrians, Romans, Slavs, Venetians, and then after long sieges, the Ottomans in 1478 and the Montenegrins in 1912. It was nice walking around the castle. 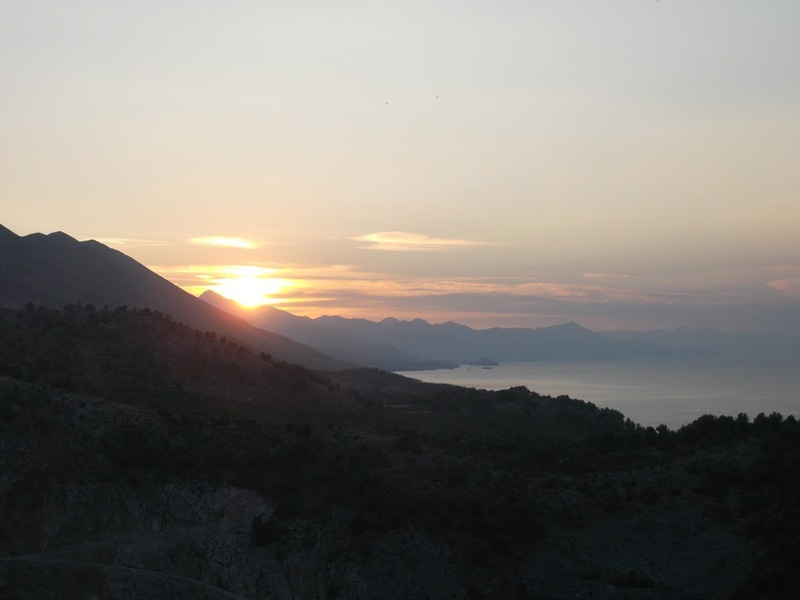 The sun was setting and the view is nice of Lake Shkoder. There were about five different couples up there taking wedding photos. I headed back to Florian’s for dinner. Breakfast and dinner are included for a few extra euro. Everything they eat is made within their compound. 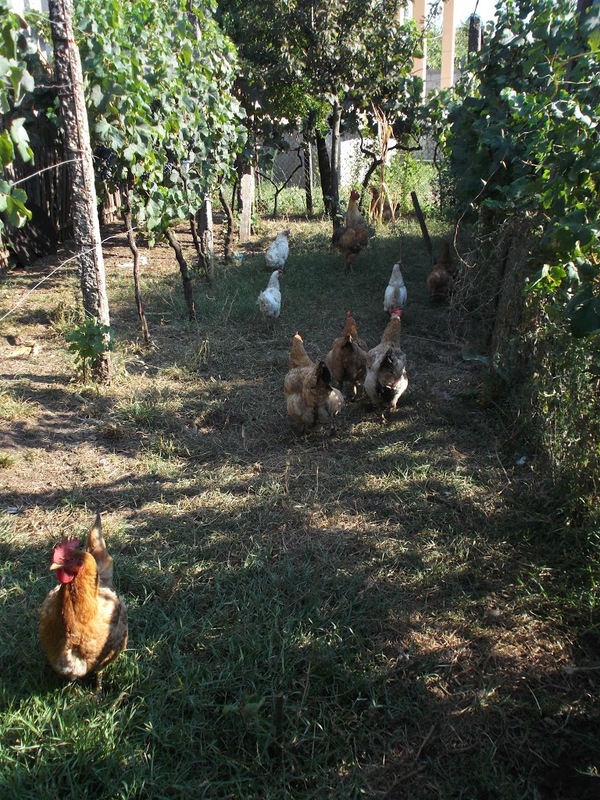 They grow their own potatoes, peppers, tomatoes, cucumbers, eggplant, there are chickens, goats and cows running around, there are vines around the garden on which grow grapes for their homemade wine. There’s a fig tree so they have fig jam and they make their own bread. Florian told me they never go to the shop. 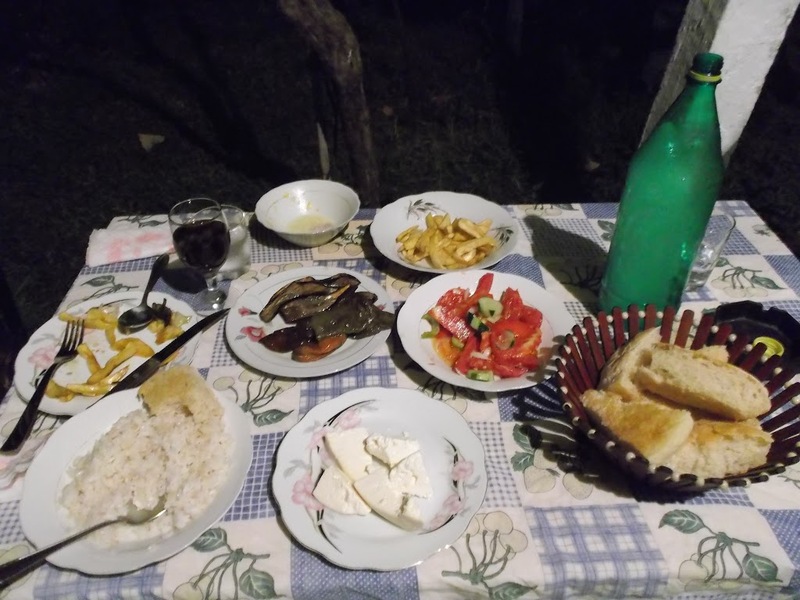 After I finished my dinner and was drinking some of the homemade wine Florian offered me some goat meat that was very fresh because they had just killed it recently. 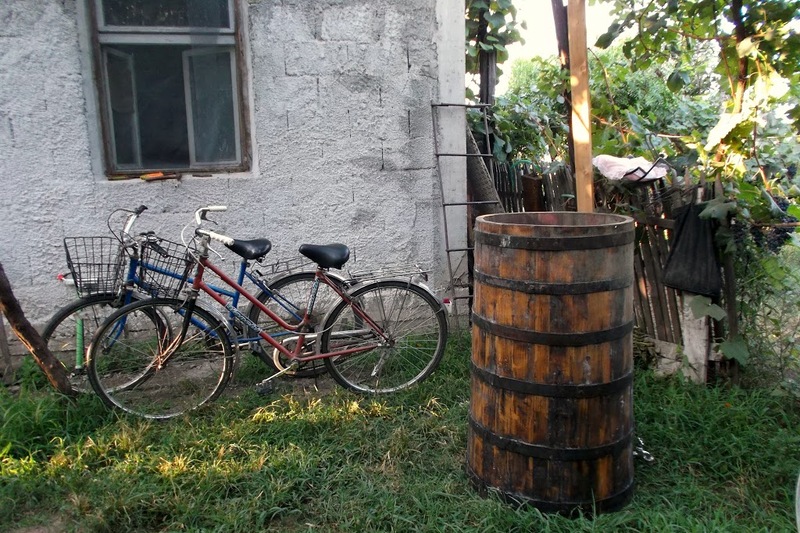 This was an Albanian experience that I hadn’t expected to have. I bought a bottle of their homemade wine and spoke with Florian. I wondered about the place. There are a few generations living in the building, some cousins, nephews and nieces, lots of people running about. 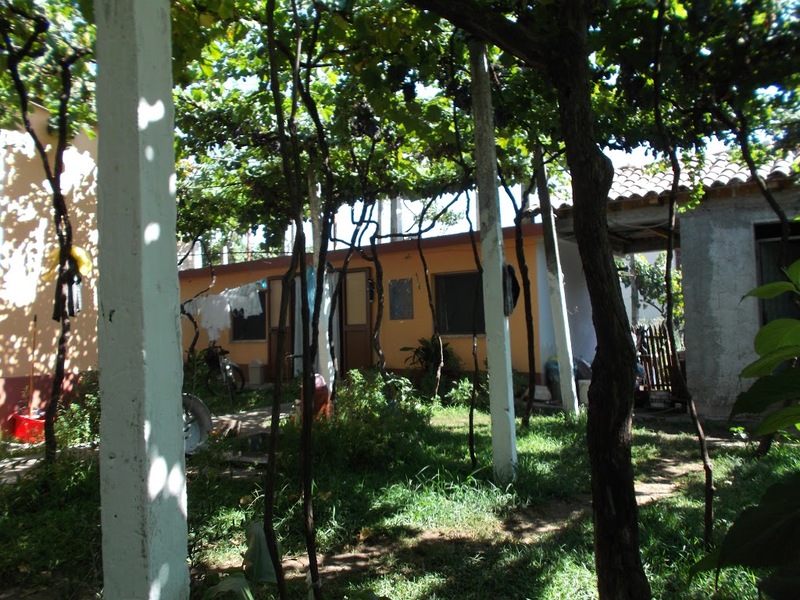 It’s been the family compound for about the past sixty years or so. He told me stories about his family hundreds of years ago, how there was pressure from the Ottomans to change religions, but they refused and headed up to live in the mountains instead. He said there have been two bad times in Albanian history: the Ottoman years, which was bad from the outside, and the communist years, which were bad from within. 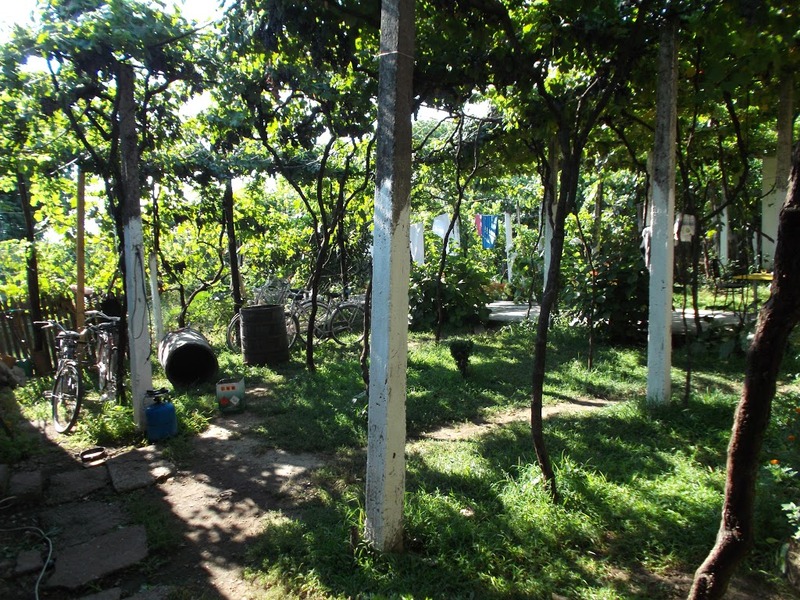 He has worked for a number of years in tourism and has worked various jobs in the region, but has run this guest house for the past two years. 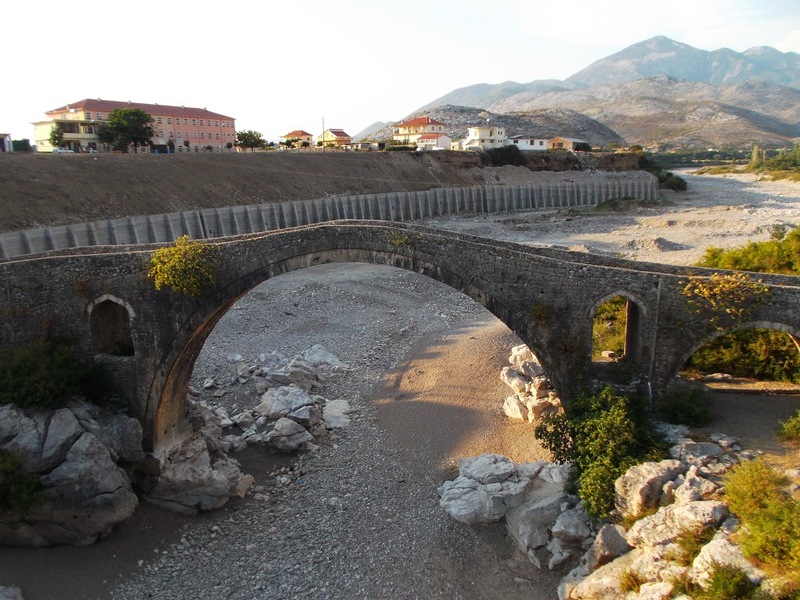 He says that in 2005 there were 6,000 tourists to Albania per year, but that it’s closer to six million now. He wants to go abroad for a year to Canada or Switzerland to work at a ski resort and learn more about developing Albania’s tourism. 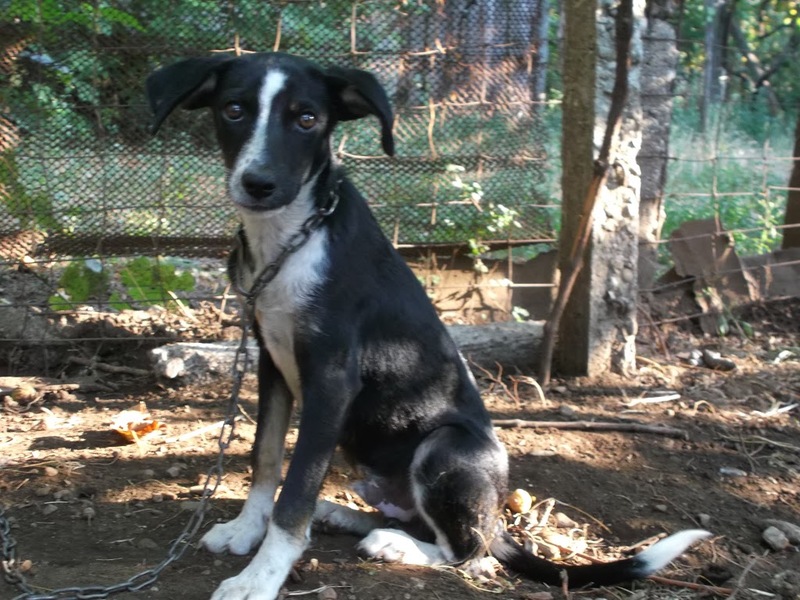 He told me a story about a kid who had stayed at the guest house two years before, who had gotten a call that his mother was ill, so he had to go to Podgorica and fly home. 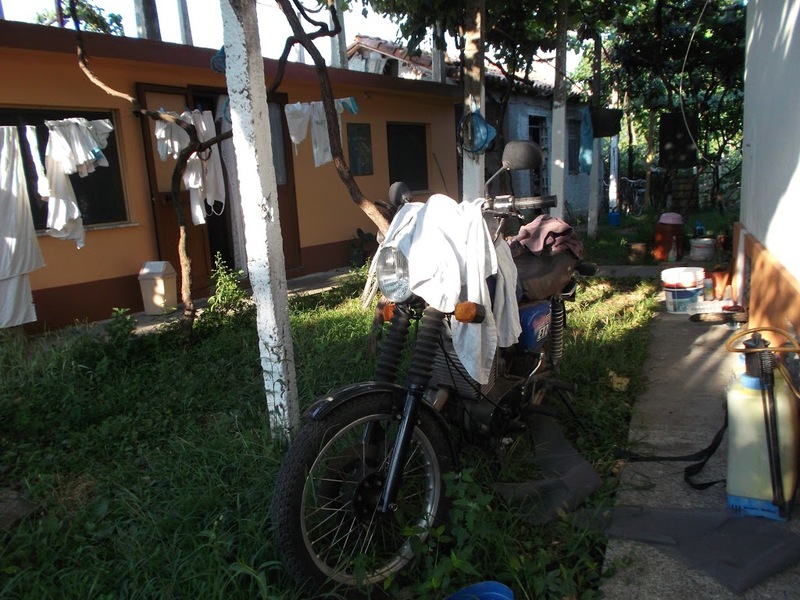 He’d been on a motorcycle journey, though, so he left his motorcycle at Florian’s. Florian assured him that he wouldn’t touch the bike, but the kid was skeptical, thinking he’d never see it again. Now, after two years, Florian still has the bike and the kid is coming back sometime in September. 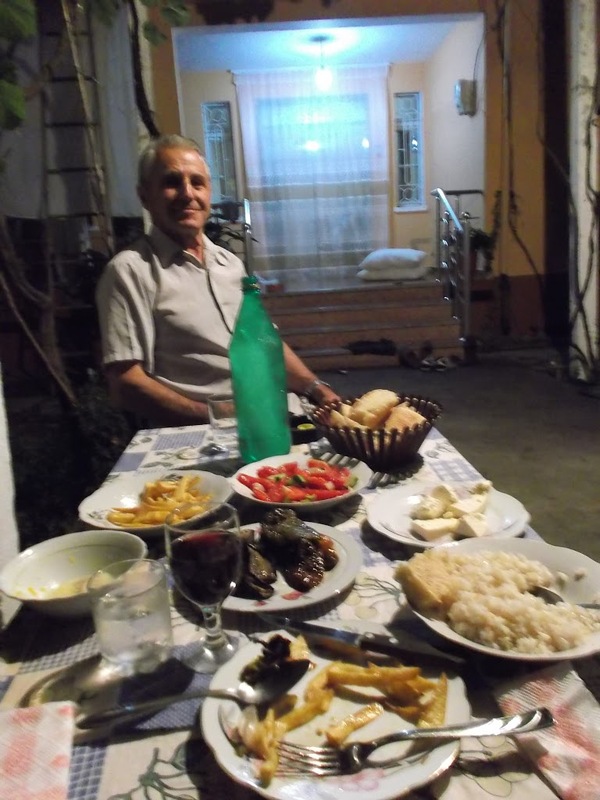 He told me about another guest, some Japanese guy who had traveled to Shkoder because he was writing a book about the blood feud tradition in Shkoder, so Florian helped him out, telling him stories and putting him in contact with people. 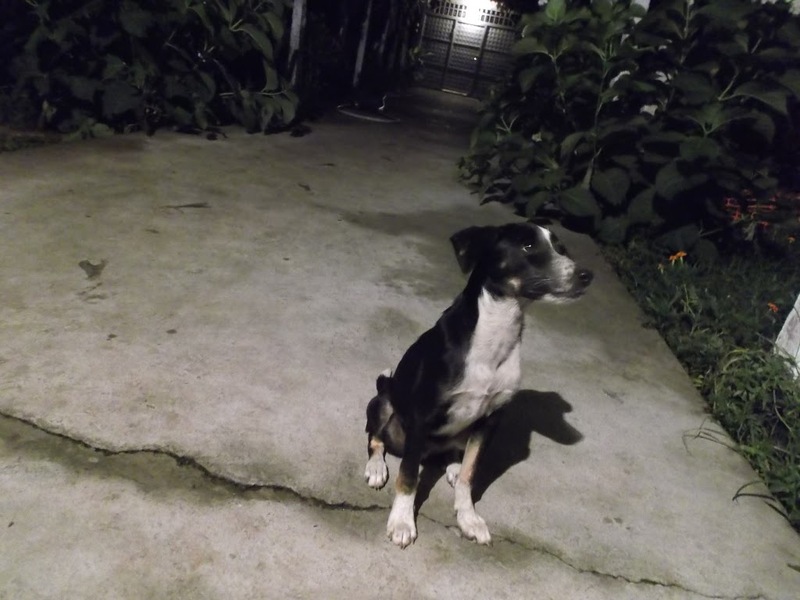 The next morning I was awoken by the scrappy little dog I had met the night before, which was running around, wagging his tail, barking happily at the chickens at 5:30am. I threw my things in my bag, had a light breakfast and readied myself for the minibus ride up into the mountains. At 8:00 an old, orange Mercedes 4×4 minibus rolled up and I squeezed myself in.